you are here: home » Impact » Stories » You Will Lose Everything! “But I don’t want to fight!” wailed little Bong* as he wiped his dirty little fists across his eyes. “You have to! You must! You have no choice!” yelled the calloused guerrilla captain. Little Bong glanced at his father, knowing full well what he would see. His father obeyed the captain without question. Not only did he need to support his family but being a guerrilla fighter gave him benefits such as medical care. His father spoke, “Bong, think of it! What an honor! You are only 7 but you are strong. Now you get to help carry our captain’s ammunition and be important to the success of the fight.” Little Bong dropped his eyes and stared at the floor as tears dripped off his nose and fell with a soft splat on the bamboo floor of his hut. He didn’t care about “honor” or the “success of the fight”. He just knew he was scared. He wanted to stay at home and play with his brothers. But today, he had to grow up. That night, little Bong wasn’t hungry. He picked at his rice and dried fish. Finally, he got up and went to his usual corner to sleep. Normally, he fell fast asleep as soon as he lay down at night, but tonight, his heart was so heavy that it seemed to nearly suffocate him. This job of being a porter for the guerrilla forces continued year after weary year. There was no school in his village and no hope of a better life or of ever being anything but a guerilla. He seemed doomed to an endless existence of fighting and running for his life. Fear was his constant companion. Relaxing and being happy were luxuries which were not his to enjoy. His childhood had been stolen. Nights were spent sneaking through the jungles, ambushing the enemy and killing them in cold blood. The only bright spot was when his parents arranged for his marriage. At least Lindy* was sweet, cute, and kind. Within one year of marriage, baby Jaz* arrived. She was a precious baby girl, and this made Bong re-evaluate his life once again. He still desperately wanted out of the guerrilla regime. But how could he leave? He had to support his family. One day, when walking past the neighbor’s house, he heard a radio playing. He paused and listened. It was a religious program called Adventist World Radio. It spoke about Jesus. He had never heard about Jesus before, so he listened with growing curiosity. The next day, he went to the neighbors and asked if he could come and listen to that program. They agreed. 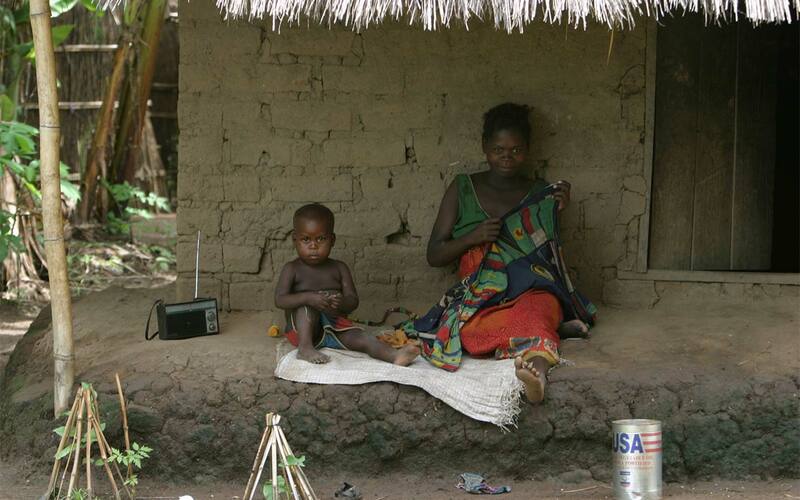 Since he still has no radio of his own, he went to the neighbor’s every day to sit and listen to the broadcast. Much to Bong’s surprise, AWR provided some funds to help him start his own small business. Today, he has a small grocery store where he sells dried fish, rice, oil, salt and vegetables. He grows vegetables and hikes many hours down to the lowlands to sell his produce. With that money he buys big bags of rice and other commodities to take back to his store. Bog has discovered that God’s promises are true. At age 20, Bong began to attend the mission school. It didn’t matter to him that he was in first grade with children 15 years younger than himself. Now he can read and write. He loves to sing the songs and hear the many Bible stories at school. Every morning, he leads his young wife and baby in worship. Sweet young Lindy will soon be ready for baptism. Bong does everything he can to recruit his friends young and old to attend church services at the little school and several are now attending. He and his wife, along with some of the friends he has influenced, were able to hike 12 hours to the lowlands to attend a recent special weekend for the students of the mountain schools. One of his recruits is also a father. He is now sending his three children to the SDA school. He wants to be baptized with his whole family someday soon. Click here to find out how you can help other rebels, like Bong, as they leave their former lives behind. * Name changed for security.